Get A Free Quote / Book Now! Providing luxury transportation since 2001, Eagle Vail Express is the premier choice for all your Denver to Vail transportation needs. Founded by Matt Darpli, our vail transportation service is a member of the National Limousine Association and has received an A+ rating from the Better Business Bureau. Backed by over 25 years of extensive winter driving, our seasoned chauffeurs provide safe, high-quality and affordable Denver to Vail Limo service to some of Colorado’s most desirable mountain locations. Whether it's Eagle Vail airport shuttle service or privately chauffeured travel, our 24/7 service will make it easy to arrange exactly what you need from our fleet of Cadillac Sedans, Chevy Suburbans, Stretch Hummers and much more! Why Book With Eagle Vail Express? At Eagle Vail Express, customer satisfaction is our number one priority. Once you have booked your travel, our Vail limo and Vail Taxi drivers will arrive to transport you in style. Specializing in Denver to Vail transportation, we also service the Eagle Vail Airport with the best shuttle service in town! Please call for rates to all other Colorado destinations. Eagle Vail Express is Colorado's premier provider of Vail Transportation and Vail Denver transportation. Give us a call to book your Eagle Vail Airport transportation to Vail or your transportation from Denver to Vail. Eagle Vail Express is the premier Vail Limo Service and Vail Limousine company offering superior vehicles and customer service. We offer great rates for Vail Limo and Vail Limousine Service and World Class Customer Service. 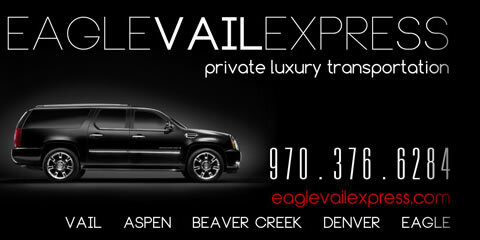 Eagle Vail Express is your #1 Choice at the Vail Airport. We provide Vail airport shuttle, Vail airport transportation and Vail airport limo service from the Eagle Vail Airport to Vail Colorado. Eagle airport transportation has never been easier! We provide Breckenridge shuttle from denver to Breckenridge and Breckenridge transportation in private luxury SUV's and Executive Vans. If you are looking for a shuttle to Breckenridge check out our competitive rates. Eagle Express provides Aspen transportation and Aspen Limo to all Aspen Hotels with transportation to Aspen from Denver and Eagle Vail Airport. Eagle express is an Aspen Limousine with transportation Denver to Aspen and Eagle to Aspen. Eagle Vail Express provides Beaver Creek shuttle and Beaver Creek transportation from the Eagle Vail airport and the Denver International airport to all Beaver Creek Hotels. Planning a last minute trip? Or flying in late? Available for trip planning and reservations 24/7, our Vail limo drivers are at your service. We specialize in Eagle Vail Airport Transportation and Denver to Vail limo service including travel to Beaver Creek, Breckenridge and Aspen. We are your Colorado Mountain Limo and Vail Express Transportation Expert! Give us a call today! Specializing in Eagle Vail Airport Transportation to Vail, Beaver Creek, Breckenridge and Aspen, we are your Colorado Mountain Limo and Vail Express Transportation Expert! National Limousine Association Member, since 2001, Eagle Vail Express is a Safe, high quality and affordable choice for Vail transportation, Denver to Vail Limo, Denver Limo and Vail Airport Shuttle. Arrive at the Sonnenalp Vail, the Vail Cascade Resort and Spa, The Arrabelle, The Four Seasons and all other Vail Hotels in safety, comfort, reliability and style! Give us a call today!